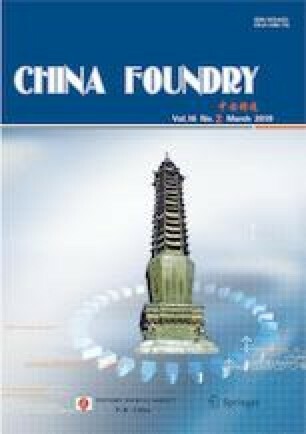 This study aims to remove the metals (inorganic and heavy metals) in waste foundry sand (WFS) via chemical washing method. Washed waste foundry sand (WWFS) samples were obtained by using triptych washing successively with 5 M HCl, 5 M H2SO4 and 5M NaOH solutions. Analysis on functional groups, micropores, heavy metals, and inorganic components of WFS and WWFS was carried out by using FT-IR, SEM and XRF. Results show that the concentration values of some inorganic components such as Ca, Fe, Mg, S were decreased, and the maximum removal percentage of these inorganic components are 47%, 19%, 32%, and 8%, respectively. The concentration values for each of the heavy metals of WWFS are below of limit values given in App-3 List of Regulation on General Principles of Waste Management. The removal percentages of Pb, As and Zn elements are 100%, 71%, and 40%, respectively. The findings of this research suggest that WWFS can be used in more applications due to its ability to remove heavy metals and some other inorganic components. Senay Balbay Female, born in 1982 in Turkey, Ph.D. She obtained her PhD degree in chemical engineering at Bilecik Seyh Edebali University in 2017. Her research interests are mainly focused on carbon materials, recycling of industrial wastes, nanotechnology and hybrid sol gel coating. To data, she has published over 25 technical papers. Regulation on General Principles of Waste Management, RGPWM, (05.07.2008, R.G. : 26927), ÇOB, Ankara, Turkey, 2008, https://doi.org/www.resmigazete.gov.tr/eskiler/2015/04/20150402-2.htm. Shokri B, Abbasi Firouzjah M, Hosseini S I. FTIR analysis of silicon dioxide thin film deposited by Metal organic-based PECVD. https://doi.org/www.ispc-conference.org/ispcproc/papers/791.pdf.